Having published the market studies Bags and Sacks and Flexible Packaging, Ceresana has now done research in another area of the European market for packaging: Corrugated Board, Solid Board and Cartonboard. The present market study offers a comprehensive overview of the production and consumption quantity as well as of trade flows of corrugated board, solid board and cartonboard packaging. The demand for corrugated board packaging will be analyzed individually in 10 applications, e.g. food and tobacco products, beverages or chemical goods. The demand for solid board and cartonboard packaging will additionally be analyzed in 14 sub-segments, such as non-alcoholic beverages, alcoholic beverages, chilled and frozen food or pharmaceutical products. Ceresana's analysts expect that the European demand for corrugated board, solid board and cartonboard packaging will rise to a total of about 38.7 million tonnes by 2021. Apart from the popular rectangular cartonboard packaging, this study also counts cans, fiber drums or similar packaging made of rigid paper among solid board and cartonboard packaging. The unique properties of corrugated board ensure that this material is perfectly suited for shipping packaging. The excellent product protection whilst being of low weight as well as an outstanding stackability play an important role here. More and more people use mobile end devices with internet access. Online offers become available from everywhere and accessing those turns more and more into the daily routine of many customers. The turnover of e-commerce is rising in many European countries by more than 15 % every year! This rapid development will also stimulate the demand for shipping packaging in Europe further. The growing competition from Internet trade is already having a significant impact on stationary retail trade. It is therefore all the more important to design the local workflow as efficiently as possible and to present the products on offer at the POS in an ideal way. In this context, shelf ready and retail ready packaging made of corrugated board is gaining further importance. Besides the traditional function of a secondary or transport packaging, i.e. protecting the product and keeping individual goods together, further aspects are now coming to the fore. Shelf ready and retail ready packaging are to be perfectly integrated in the process of supply, logistics, registration of goods as well as presentation and sales (easy identification, easy open, easy shelf, easy dispose, and easy shop). The transport packaging gains more and more importance as advertising media and marketing space. Folding boxes made of solid board and cartonboard can also profit from the growing importance of new distribution channels, above all the Internet. It is decisive for presenting a product online that it can be illustrated authentically, rich in contrast, clearly arranged and visually appealing. A 360-degree view of the article should also be available. For all of these aspects, folding boxes offer the desired properties. Due to their rectangular shape, they have clearly defined contours, offer versatile and high-quality printing options and do not cause any reflections when taking a photograph as they are not shiny. The layout options are nearly infinite; even a premium solution for a high-quality gift packaging can be realized easily. It is also relatively easy to offer the folding box packaging in different sizes, thus complying with the requirements of multi-channel retailing. When shopping online, costumers more often buy family-size packs as they do not have to carry them home themselves. In many areas of the packaging market, packaging solutions made of plastics gain in importance at the expense of other materials. In the case of non-alcoholic beverages, for example, PET bottles are still replacing the conventional beverage cartons in the segment fruit juices; in the segment milk, HDPE bottles gain more market shares. However, it is not always necessary to make a choice between cartonboard and plastics. In the application chilled and frozen food or even in the growing segment of ready-made meals, combinations made of both material groups are used more and more often. For example, a plastic tray as primary packaging is often combined with a secondary packaging made of cartonboard which is better suited for high-quality printing and brand presentation (We also offer a study on the European food packaging market). Chapter 1 provides information for Europe as a whole and for 24 individual countries regarding the volumes of production, import and export as well as the demand for corrugated board, solid board and cartonboard packaging. Data is provided in tonnes for the period of 2005 to 2021. 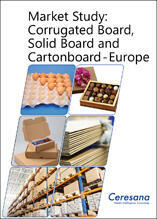 In addition, chapter 1 contains detailed information at country level about the demand for corrugated board, solid board and cartonboard packaging, split by the two types of material "corrugated board" and "solid board and cartonboard" as well as its respective most important applications. Chapter 3 provides profiles of the largest manufacturers of corrugated board, solid board and cartonboard packaging, clearly arranged according to contact details, turnover, profit, product range, production sites, profile summary as well as product types and applications. More detailed profiles are given for 70 manufacturers, including, amongst others, Tetra Pak International S.A., International Paper Co., Smurfit Kappa Group Plc, Amcor Ltd., Sonoco Products Co. Ltd., DS Smith Plc, Huhtamäki Oyj, Coveris Holding S.A., Mayr-Melnhof Karton AG, SIG Combibloc Group Ltd. and Essentra Plc.